Members of the 445th Aeromedical Evacuation Squadron from Wright Patterson Air Force Base receive a presentation as Grand Marshal of the 37th Annual Vandalia-Butler Chamber of Commerce Air Show Parade. Receiving the plaque from Chamber President Jan Flynn is Vandalia native Nathan Hutchison. 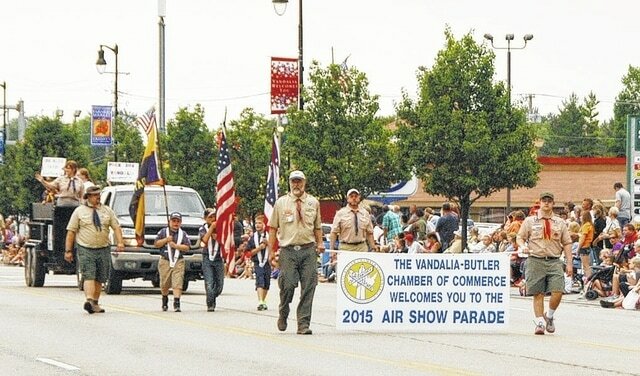 VANDALIA — After several consecutive days of rain, planners for the Vandalia-Butler Chamber of Commerce Air Show Parade had an eye to the sky as time for the annual summer spectacle neared. Mother Nature must have been ready for a parade, however, as threatening skies held off for the duration of the event which thrilled those along its route with marching bands, drum lines, and even a man-made shower of water from the massive firefighting truck from the Dayton International Airport. Vandalia Mayor Arlene Setzer and Chamber President Jan Flynn welcomed members of the 445th Aeromedical Evacuation Squadron from Wright Patterson Air Force Base as the parade’s Grand Marshal. Nathan Hutchison, a Vandalia native, accepted the Key to the City on behalf of the squadron. Also featured in the parade were traditional favorites such as the Butler High School marching band, Butler Kickline and Guard, and police and fire units from both Vandalia and Butler Township. The parade was narrated by City of Vandalia Communications Manager Rich Hopkins and Vandalia Drummer News Editor Darrell Wacker.